I’m visiting my home town of Shawville, Quebec this week. I’m down to visit family but also to help my Grandma get rid of some old stuff. It’s probably a good thing to take a week off from “work,” even if only to take a rest from biking. Garbage day in Shawville was Tuesday morning. I went out Monday night but unfortunately didn’t find anything. It would have been cool to find some neat stuff here, a town of around 1200 with a lot of history. It’s been a while since I posted so I’ll try to tide you over until next week with a few things I found on Thursday. I went out to Rosemont (between St Hubert and Papineau) in the morning and another part of Rosemont (between Cartier and Iberville) in the evening. Here’s a few cool books I found in the morning. The one on the top left is a reference book for auto mechanics made in the 1940s. It holds some pretty cool diagrams and pictures of the old-school car technology. On the bottom left is an old French language textbook from 1911. 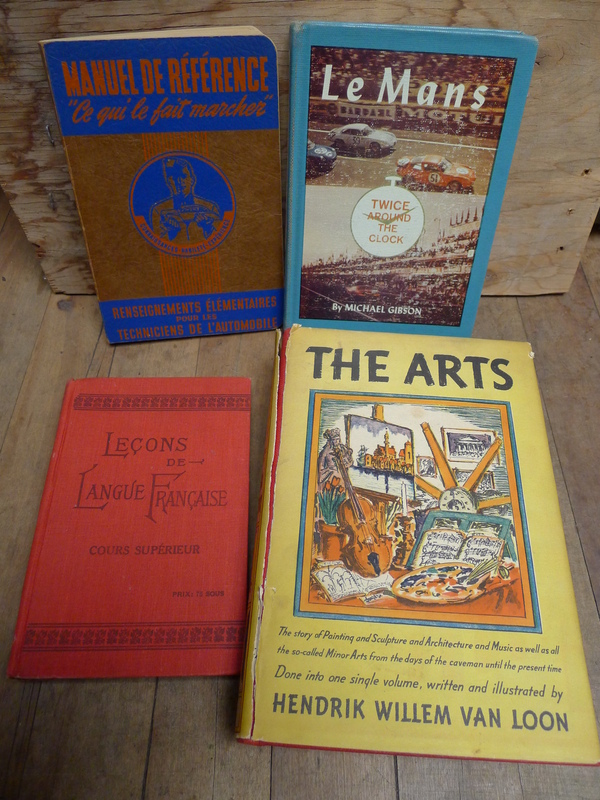 I also like the art book by Hendrik Willem Van Loom from 1937 (bottom right). 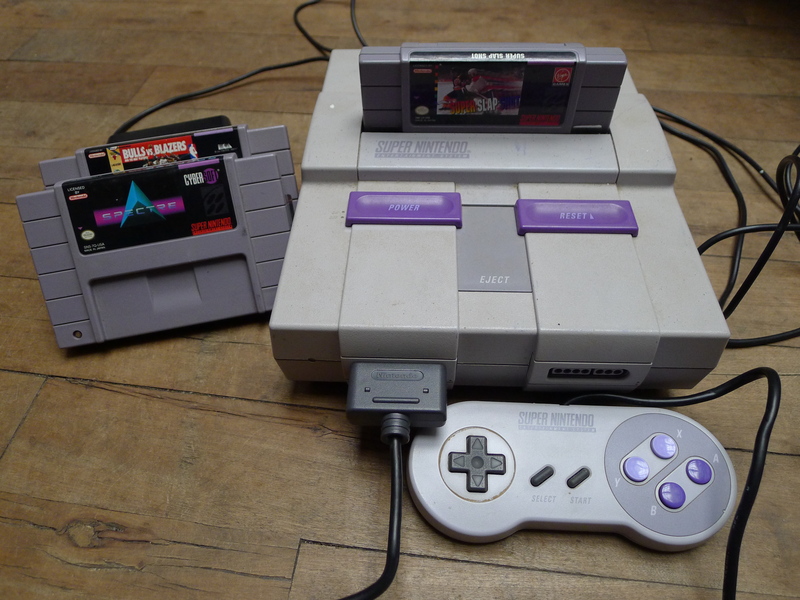 In another spot I found a Super Nintendo with a few games. The system turns on and I’d bet it works just fine. It’s not worth much, maybe around 15$ for the lot if it works, but there’s definitely people out there who’d still love to have it. In the same place as the Super Nintendo (on Garnier near Beaubien if I remember right) was a little box with some jewelry and other bric-a-brac inside. A lot of it was junk but there were a few nice pieces that should make be a bit of money. The two rings and cross on the left are all 10k gold. None of them are worth reselling as is, but given that they weigh around 5-6 grams they’re worth around 100$ in weight. 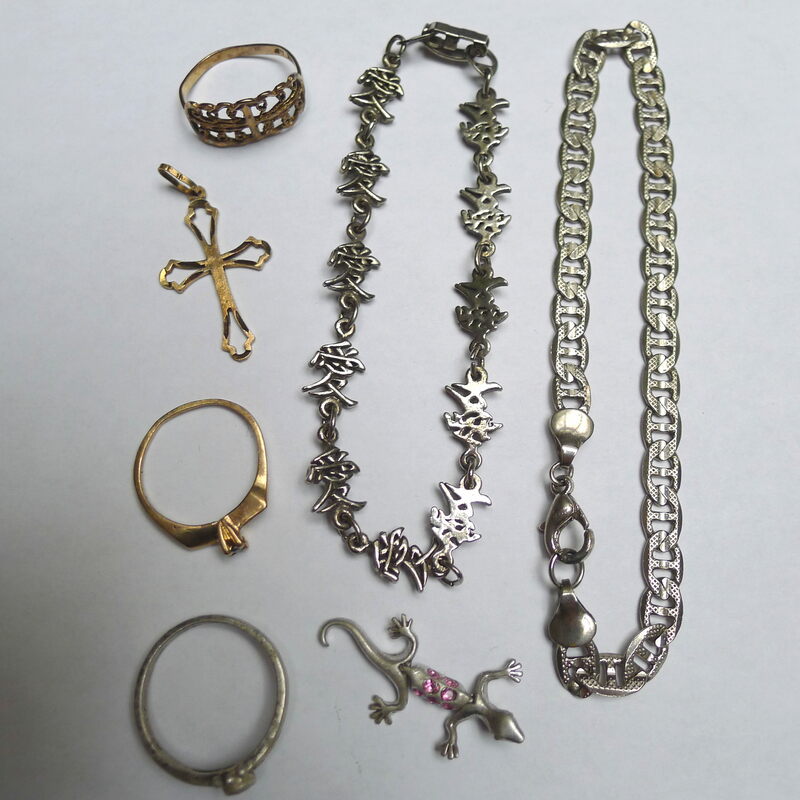 The ring on the bottom left and the little lizard are sterling silver. I tried cleaning the ring with the tin foil and baking soda technique but it didn’t shine up too well. The technique work well a lot of the time but I might have to track down a more potent silver cleaning product as there are some pieces that seem resistant to it. I think the bracelets might be silver too, but there’s no marks so I’d have to test them otherwise. The evening wasn’t particularly productive, providing only this haul of canned food that looked to be left over from a move. Most of it is expired, but as I’ve mentioned before expiry dates on canned food are basically completely made up. I already ate the canned soups and the baked beans and I’m fine! I’ll be back in town on Friday morning and I think by then I’ll be hankering to search for some more trash. Depending on how tired I am I may try to make it out to the Friday evening pickup in the section of Rosemont east of Iberville and west of St Michel. Either way I’ll let you know next time I find anything! can i have the campbells mushroom soup please? 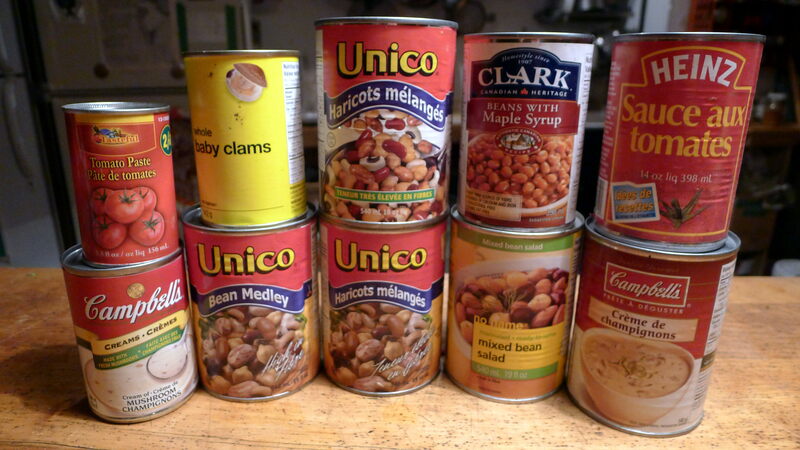 Love your food finds,jewelry finds and book finds.These cans all have very edible food.Last year I ate six cans of lentils,chick peas and soup that were more than four years old from a friend who was moving out of Quebec temporarily to do PHD research in Korea and China. The food in the cans tasted great and I am very healthy more than a year after eating them.Many guys throw out canned food that is very consumable. Congratulations!You now have over 2000 subscribers/followers to your blog.It is a towering achievement.Please start charging for ads selectively on your blog and make the money your talent deserves.You should still live a mostly alternative,frugal lifestyle and continue garbage-hunting. I was on Tupper street in downtown on Wednesday morning,i.e. yesterday.The recycling truck had not yet passed on Tupper street,but it had already picked up all the curbside recycling on neighbouring Baile Street.Anyways,I found seven great English,French and Spanish dictionaries and thesauruses in excellent shape in a box on Tupper street next to a recycling bin.They were left out for the recycling truck.I rescued them.I don’t think anyone else would have rescued them.I am pretty sure the recycling truck must have come on Tupper street within the next 30 or 45 minutes.Tupper street is a busy street—-I wonder why nobody saved those dictionaries before me.Despiter the convenience of internet,those dictionaries new would cost more than $150 new in a bookstore.Bottle and can collectors had seemingly taken out almost all the beer bottles and cans on Tupper street,but the books were untouched.In some plastic recycling bags,there were holes.Scavengers had apparently ripped small holes in blue recycling bags to take out aluminum cans.I am saddened by the thought of how much good stuff in good neighborhoods must go unrescued before the garbage or recycling trucks come.Do you rescue dictionaries and books regularly?Why don’t you check out curbside recycling bins and boxes and bags ? And the reality is, if something is put out for recycling it’s going to be recycled (or at least go through the motions). Stuff put in the garbage will just go to landfill. Cans and bottles belong in recycling. The scavengers aren’t “saving” those items, they are just getting the five cents per can deposit. They’d get their way back into the recycling anyway. I don’t know whether it’s changed, but years back I remember a newspaper article saying that can and bottle deposits were too effective in Quebec, they actually counted on a certain amount of “loss” to help pay for the system. The system had become effective enough that they weren’t gaining enough from the 5cent deposits. That was years back, I don’t know whether it’s changed. If cans go to recycling, they get recycled, but the 5cent deposit remains in the system. That was before door to door recycling became fairly universal. I’m sure a lot of cans go in the recycling because it’s easier than taking them back. Lots of convenient places don’t really like to take cans back. And you have to wait, so you balance that against the small amount you’d get back. The deposits were introduced in order to make people think twice about tossing bottles by the roadside, or putting them into regular garbage. And then on the other side, it takes a lot of cans to get even a bit of money. It’s one thing if you have no choice, but a big bag of cans might bring four dollars, while other items that can be found will bring in at least as much for less bulk. Which is why that guy at one end of the pile one July 1st was so happy to find cans, while I would never bother with them, but found interesting things like a wifi router and some DVDs at the other end of the pile. The people actually scavenging cans out of the garbage, despite the potential mass, are really making a difference, and they get their five cents per can. I just discovered this blog a while ago and I’m addicted. Thanks so much for writing it! I wanted to tell you I think that Nintendo is worth a lot more than 15$ on Ebay! I don’t know. I don’t see game consoles all the time, but I’ve found quite a sequence of different game consoles over the years. It’s like a museum of consoles. The first one was cartridge only, but the 3 or 4 that followed all had cd or DVD drives. What is interesting is that I don’t see games with them. Which might mean someone found the games first and left the consoles, or the owner realized the games might have more value. While I’ve not gotten around to trying it, I’m still puzzled why I found an XBOX 360 in the summer. Of course, fatal problem may be anticipated. That blu-ray player I found near McGill around July 1st worked with DVDs, but when I finally got a blu-ray disk to try that, the machine said “no disk found”. All it took was a bit of rubbing alcohol and a cotton swab, and I cleaned the lens (a blu-ray player has two, one for DVD the other for blu-ray) and it worked. I haven’t actually watched the blu-ray movie, so perhaps there is some other issue, but not being able to play a blu-ray disk might have een enough for the owner to toss it. Since the game consoles of more recent times have CD and DVD drives, [erhaps that is an issue causing the tossing. A lot of things get tossed before they become valuable again. People pay good money to buy in early, then something newer comes along, and nobody wants the earlier generation, too old compared to what’s come in more recently. So a lot gets discarded, until much later, people are nostalgic for the old, at which point the price is gone up because suddenly there is demand, while quantities have been lowered from the tossing. The time to collect is in that lull period when nobody wants it. Rough Trade NYC: A new branch of a London record store is scheduled to open Monday in Williamsburg, Brooklyn. BUZZSAWS were buzzing, hammers were hammering, and a sea of empty display racks awaited their wares one morning this week in a cavernous storefront in Williamsburg, Brooklyn. It was a typical scene of retail construction in every way except for what was coming: a record store. Follow @nytimesarts for arts and entertainment news. A sortable calendar of noteworthy cultural events in the New York region, selected by Times critics. .When it opens on Monday, Rough Trade NYC — a branch of the London shop that has been an independent tastemaker since 1976 — will be the biggest record store in New York City, an ambitious bet on CDs and vinyl at a time when thousands of other music retailers have closed, and the music industry over all looks to a largely digital future. Rough Trade NYC, on a not-quite-postindustrial block of North Ninth Street, near the East River, is the kind of place that most music fans had given up hope for in New York: an airy 15,000-square-foot temple to record retail, with a coffee counter and a 300-person-capacity performance space with a bar that will present concerts almost daily. In the planning for four years, Rough Trade NYC has the enthusiastic support of record labels, which see vibrant independent shops like it — including the hangar-size Amoeba Music in California and the small but influential Other Music in the East Village — as not only sales outlets but also social spots that counter the perception that the record industry is dying. Like almost everything in the music business, the role of record stores has shifted in the last decade. Once a retail staple, with anchor chains in malls and mom-and-pops around every college campus, record shops have been decimated in most areas. Tower closed its 89 American outlets in 2006; Virgin shut down its last Megastore in North America in 2009; and, in Britain this year, the once-mighty HMV chain shuttered dozens of stores while in receivership. “If you create an atmosphere that is conducive to spending time, then people will buy a record, whether it’s on their first visit, or maybe second or third,” Mr. Godfroy said. But surviving in the current market is not as easy as stocking collectible products and adding a cafe. Almighty Music Marketing, a company that maintains a retail database, says that more than 300 music shops have opened since 2009. Yet, in New York, another batch has gone to the vinyl graveyard over the last year or two, among them Bleecker Bob’s, Rockit Scientist, Tropicalia in Furs, Gimme Gimme and Big City. Still, Williamsburg and Greenpoint are dotted with stores, including Academy Record Annex, Permanent Records and Record Grouch. Mike Dreese, a founder of Newbury Comics, a chain of nearly 30 music and pop-culture shops in New England, praised Rough Trade as “the real deal” and credited the original London store with supplying punk records that helped him establish his own business in the late 1970s. But he noted the risks of a venture on the scale of Rough Trade NYC. Rough Trade opened its first shop just as London’s punk scene was exploding, and the tiny store developed a rare authority to define cool by being picky about what it stocked. Its founder, Geoff Travis, soon started a record label by the same name, and the two businesses split in 1982. The shop’s fortunes have fluctuated over the years, but it has flourished since 2007 with the opening of Rough Trade East, a 5,500-square-foot branch in London’s East End that has a coffee bar and a stage for in-store performances. Since then, Mr. Godfroy said, Rough Trade has had double-digit sales growth each year. To make what Mr. Godfroy calls a “destination-store experience,” Rough Trade NYC has gone with an industrial-chic design, its interior walls lined with the metal from 16 old shipping containers, and murals of fashionable album covers (Arcade Fire, the Velvet Underground) hand-painted over exposed brick. Concerts will take place in a spacious separate room in back, some of them free (or free with a purchase), and others booked and sold by the powerhouse local promoter the Bowery Presents. The store also includes what it calls simply “the room,” a combination promotional zone and rotating art installation. For the first undertaking in the space, Glassnote will use 3-D projectors to recreate the bedroom of the rapper Childish Gambino (who is also the actor Donald Glover, a star of the NBC show “Community”), in a design that Mr. Glass likened to the almost uncomfortably intimate work of the British artist Tracey Emin. Touches like these can give brick-and-mortar stores an identity in a market that has become dominated by the Internet, said Martin Mills, chairman of the independent record company Beggars Group. Mr. Godfroy declined to reveal the construction costs of Rough Trade NYC, but he did share some of the “hugely frustrating” experience of settling on the location and dealing with the complications of New York building permits. Rough Trade had originally hoped to open the store two years ago, he said. Time will tell whether that way includes coffee and concerts. The next two weeks are big ones for New York record lovers. Besides the opening of Rough Trade NYC on Monday, WFMU’s annual record fair is returning after a one-year absence, and Back to Black Friday, one of the two Record Store Day events of the year, is coming next Friday. The Fair Outside of eBay, your best bet for finding that $60 tropicália LP or limited edition Iron Maiden picture-disc is WFMU’s Record Fair, which benefits that famously eclectic, noncommercial radio station based in Jersey City. The fair, which has dozens of dealers as well as live performances and film screenings, was canceled last year in the wake of Hurricane Sandy but makes its return this weekend to the Metropolitan Pavilion, 125 West 18th Street, in Chelsea. For more information: wfmu.org/recfair. A version of this article appears in print on November 22, 2013, on page C23 of the New York edition with the headline: Records Are Dying? Not Here..
ran accross this, and thought of you..
Haha. Interesting. That’d be great, I’d probably have a little fun with it before selling it, sort of like Kramer did in that one Seinfeld episode. for sure…maybe get your picture taken with it (lots of stores/walmart do a nice pack for fifteen dollers, it’d be worth it, then you could have a ton of pics to include with your xmas card.